DA Hostel Almaty truly deserves a definition of the Best Hostel in Almaty! A spacious hall, pleasant atmosphere in the lounge room, a kitchen equipped with modern appliances and a separate sleeping area consisting of 4 rooms will truly give a feeling of home comfort. Guests are offered free Wi-Fi, cable TV, lockable large lockers for clothes and comfortable mattresses with snow-white linen, complete with towels will take the heat off and help to acquire new strength. We are very easy to reach and there are a lot of interesting sights nearby. Central recreation park 1.5 km. Green Bazaar and Ascension Cathedral is 1.5 km. A rope-way leading to Kok-Tobe Mountain 3.8 km. Shymbulak Ski Resort is 16 km. The International airport of the city of Almaty 14 km. 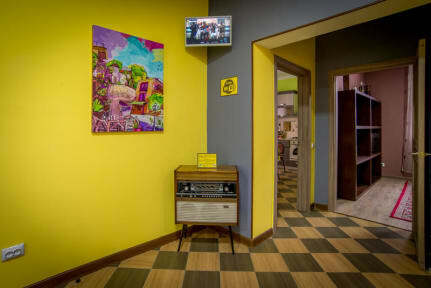 Da Hostel has been one of the best budget accomodation experience I ever had. Olya -the receptionist- does a great job. She speaks English quite well. It seems a bit far from the city center but it costs only $1,5 to get there by taxi. Chilly yard and common spaces. Clean like a home. Strongly recommended. Very clean and tidy hostel with excellent staff. I cant fault anything really. Definitely stop here along your ways. Good and nice hostel. A bit far from the city 'center' but its a ten minute walk to the subway station. Staff is friendly and helpful but didn't speak English fluently (posed no problems). Water and snacks can be bought at the reception for nice prices. Nice place to stay in Almaty! I only stopped for a night after coming from the airport at 11 pm (a Yandex taxi cost only 1500T and the Tourist information in the arrivals area was super helpful). The hostel was peaceful and comfortable with nice big lockers, so I got a good night's sleep before the next leg of my journey. 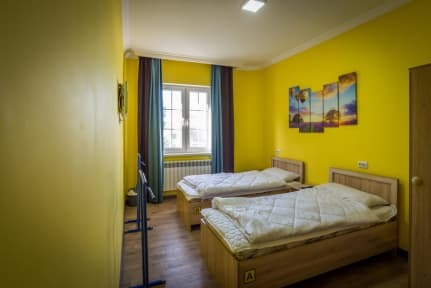 This is a good hostel, the main downside is the location being a bit far out from the city's attractions. The staff were friendly and helpful, the hostel was pretty clean and had good-sized lockers. Wifi worked fairly well too, and it's good value for money. My only other comments are that it would be good to have locks on the bedroom doors as well as lockers, and to find a way to make the shower facilities more private. I'm not sure why this hostel is rated so highly. The location isn't very good at all. It's not really near anything - and at night the area is scary as there are no street lights. The staff were sweet, but I had a few very stressful misunderstandings with them - including them trying to put a stranger into my private room. The wifi was ok. The vibe isn't great- I didn't meet many people here.